I can't get over all of the fantastic freebies that you can earn during Sale-a-Bration! Two of them are the Wildflower Fields DSP and Flowering Fields Stamp Set, which coordinate with each other beautifully. 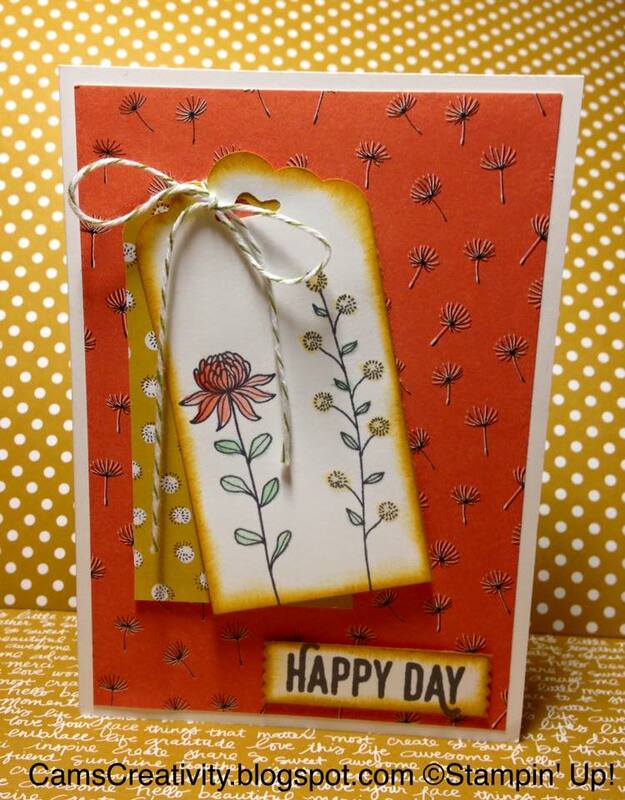 Today's card was made using the Wildflower Fields DSP as background, decorated with a Wildflower Fields tag and Flowering Fields stamped gift tag, layered and tied together with some Old Olive Bakers Twine. The stamped image was coloured using the Classic Stampin' Pads listed below and an Aqua Painter. The edges on the tag and greeting (made using the Perfect Pairings Stamp Set, also a Sale-a-Bration freebie) were decorated using a Stampin' Sponge and Delightful Dijon Classic Stampin' Pad.